Most beautiful Moth in the World! 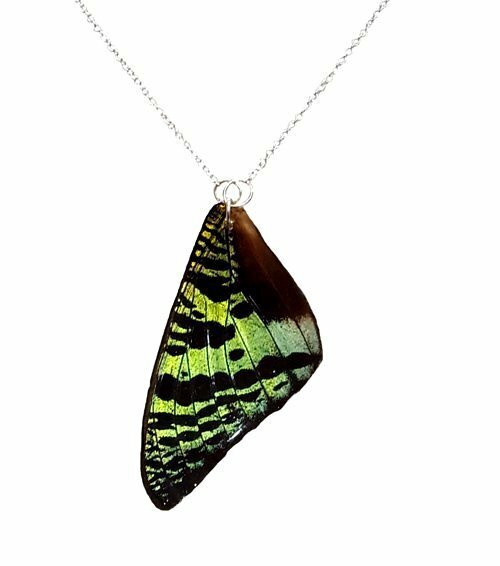 This real butterfly wing pendant is made with Chrysiridia rhipheus AKA Sunset Moth. Moth died naturally after is natural full lifespan. Purchases help save the rain forest and butterfly populations. Handmade sunset moth wing pendant. Wing coated in resin for longevity. Pendant will last lifetimes. We are leading experts in real butterfly wing jewelry sterling silver. This real butterfly wing pendant is long and elegant and can slip over your head.